Get it? Cuts? Swords? Hmm, and now -I- should make an apology..
Now this is one of this sweet little news segments. Sort of. 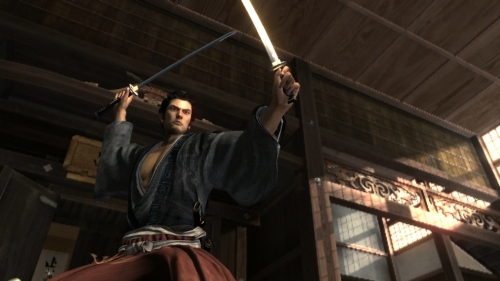 Talking to Digital Spy, Yakuza 3 producer Masayoshi Kikuchi explained that his team “did what we thought would be good for the Western market”, which certainly sounds like the official line we were given about certain elements of the first game being a bit too rooted in Japanese culture for westerners to understands. Sega have previously said that there weren’t going to be any cuts to Yakuza 4, partly due to the fact that one character’s story is pretty invested in the hostess elements if I remember my facts right, and so it was implied that they understood the mistake made the first time around. That said it’s great to hear someone actually apologise for letting down the fans of 3 who were hoping for a direct translation of the experience Japanese gamers received, and I thought it was worth highlighting here even if it isn’t the most spectacularly revelatory thing. Even with the cuts Yakuza 3 was a substantial game, and with Yakuza 4 along the way not omitting any content I think Masayoshi Kikuchi’s team might just be giving us the best Yakuza yet. So in turn, thank you very much! ‘Yakuza of the End’ is a smash hit! Great news, I’m really geared for the sequel. Even the cover art looks amazing. As someone who’s as interested in the main story as he is in exploring the world and all the weird little mini-games within, it makes me happy to know that they’ll be including it all this time around. I remember all the way back to Alex Kidd: High-Tech World where at one point you have to take a history test in order to progress through the game. In it, there were some Japanese-centric questions that I had no way of knowing at the time, but it was fun to do some trial error to get through…and I learned something in the progress. The Yakuza games are like that, just an open book on Japanese culture, so for me, the more eccentricities like that, the better.